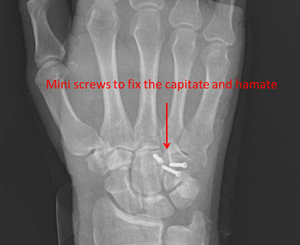 Unusual fracture dislocation involving the 4th and 5th metacarpals and splitting both the hamate and capitate.Treated by open reduction and internal fixation with mini-screws. This 67 year old lady had a bad fall resulting in a hip and a wrist fracture. 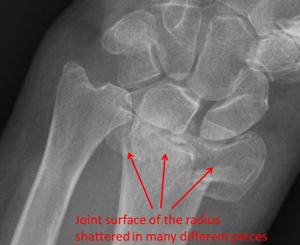 The joint surface of the radius was shattered in many small pieces and not fixable in the usual way. I used an alternative technique with a big bone graft and a bridging plate. 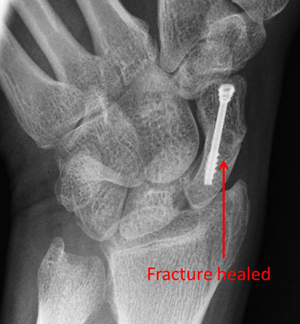 The plate was removed 4 months after the original operation to allow the wrist to move again. 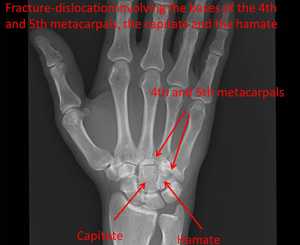 Young man with a fracture of the proximal pole of the scaphoid. MRI scan showed good vascularity of the proximal pole. Percutaneous fixation using a compression screws. 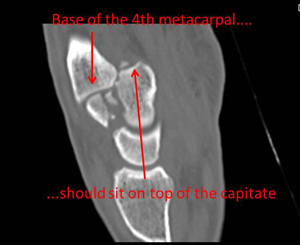 Subsequent CT scan showed successful healing of the fracture. 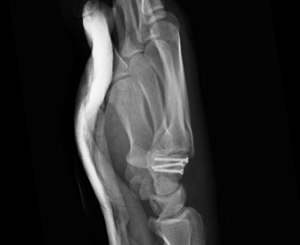 Male patient in his mid-twenties with undisplaced fracture through the waist of the scaphoid, treated in a cast for 8 weeks. 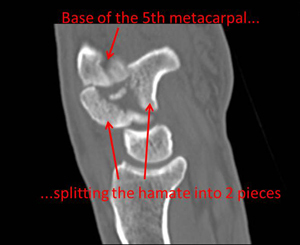 5 months later ongoing pain, CT scan confirms non-union of the fracture. 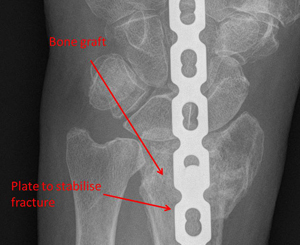 Percutaneous fixation carried out and eventually successful healing of the fracture.